This picture comes from Veronica Lanier. 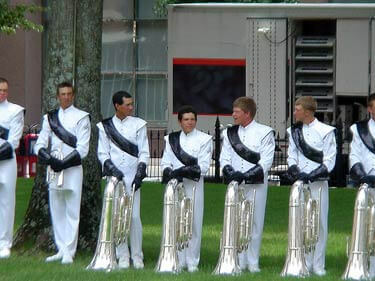 Here's a picture of my good friend Wes "Turbo" Pendergrass (third contra from the left) when Phantom Regiment came to the Old State House in Little Rock, Ark. this past summer. He and my boyfriend Michael Brence (a Madison Scout) are roommates. My favorite corps is Phantom Regiment, so he always jokes that that's the only reason why I am friends with him. Wes aged out this past summer, so this is my homage to him! The three of us all attend Arkansas Tech University in Russellville and are past and present members of the symphonic band there. Thanks Veronica!